"My time at IUPUI was transformational. 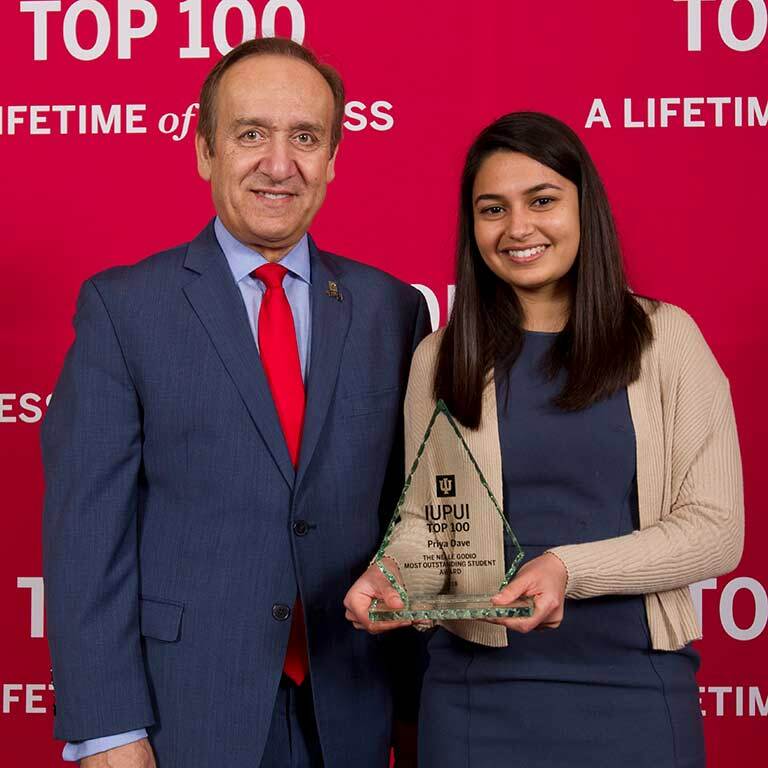 The many opportunities I was afforded not only provided me a solid foundation for medical school but also instilled in me lifelong passions and scholarly interests," said IUPUI Top 100 Outstanding Student and 2018 graduate Priya Dave. A graduate of Center Grove High School in Greenwood, Indiana, Dave was drawn to the IUPUI School of Liberal Arts Medical Humanities and Health Studies program, which studies the social, economic, and cultural contexts of health and how human beings relate to health, illness and death. The program gave her the opportunity to explore the many fields and professions that connect medicine and liberal arts. "I was a biology major when I started college, but then I took a medical humanities class and really loved it. It was an opportunity to explore something completely different that I wouldn't have had time to do while in medical school. This major was a perfect fit for me," Dave said. Dave knew medical school was in her future as a child watching her younger sister battle a chronic illness. "Seeing the doctor-patient relationship during her visits helped confirm the career I wanted," said Dave, now a med student at the Icahn School of Medicine at Mount Sinai in New York City. At IUPUI, Dave sought out experiences that allowed her to apply her interests in medical humanities to real-world situations. As a freshman, she traveled to the Dominican Republic with Timmy Global Health to help set up a medical clinic in a rural community there. Later, she traveled to Cuba with the School of Science Chemistry Department. At the University of Havana, she served as a teaching assistant in the Distributed Drug Discovery Lab, a global collaboration to educate students in chemistry and biology while seeking treatments to neglected diseases. She also traveled to Nicaragua and Panama to volunteer with Global Medical Brigades. On campus, Dave was an active campus ambassador, leading tours for prospective students and representing IUPUI at a variety of community events. Along with being the top undergraduate student at IUPUI in 2018, she was also the School of Liberal Arts Faculty Medal of Academic Distinction recipient, a William M. Plater Civic Engagement Medallion honoree, and a Bepko Scholar. "IUPUI provided the ideal environment to excel in anything and everything I could imagine. The city of Indianapolis and my mentors, instructors, and peers at this university have been monumental in achieving my dreams," said Dave.